Disclosure: Sponsored post by Lunchbox. All opinions are my own. I absolutely love the holidays because it is a time for family gathering and feasting. It's extra special for us since Christmas is also Kenzie's birthday. 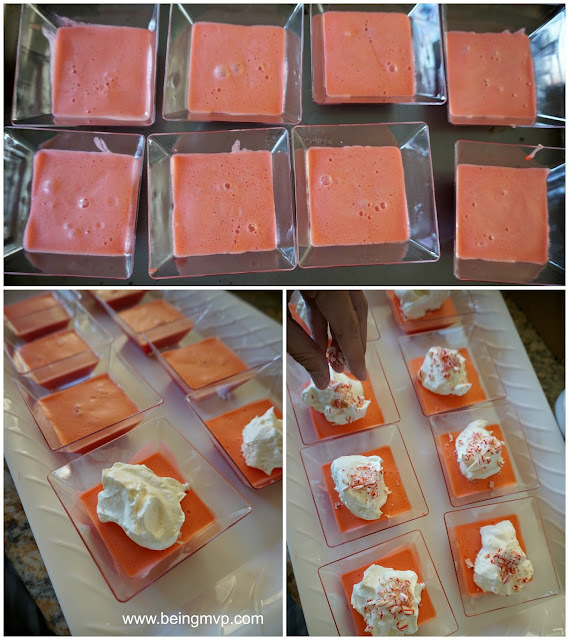 She has a sweet tooth like mama but I was surprised that her friends really enjoyed the "Frozen" jello dessert I made for her school birthday party last year. 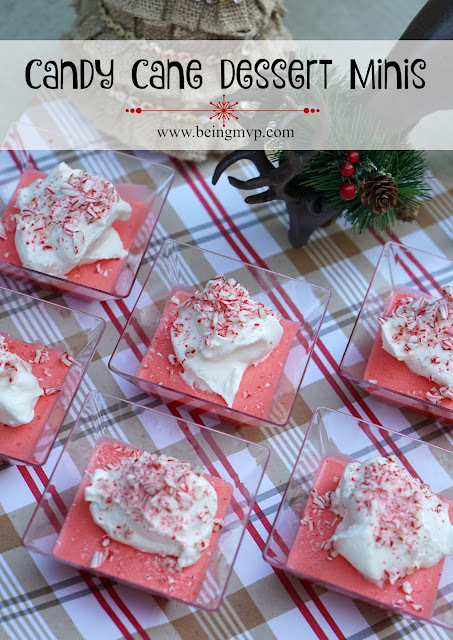 So this year I was excited to see the festive Candy Cane Dessert Minis and couldn't wait to make them for her. As you know, I'm a huge fan of easy to make foods and desserts. Mainly because I really don't have the extra time with our hectic schedule. So guess who was really happy to see that this amazing recipe only required 3 ingredients? 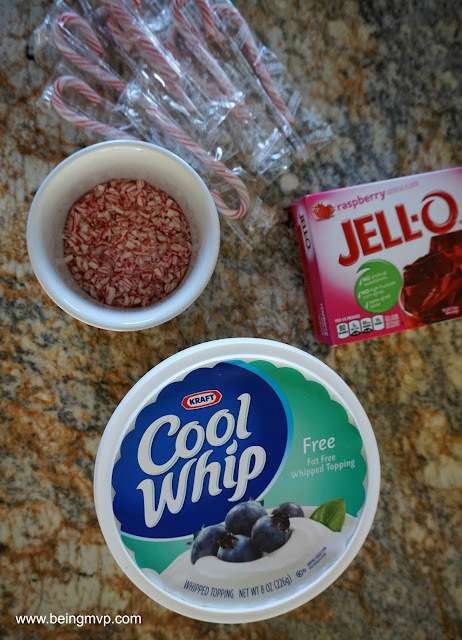 The kids like candy canes and they come in a rainbow of colors so you can technically make this dessert year round for any occasion by switching up the colors (as long as you stock up on the candy canes during the holiday season). COOL WHIP is a childhood favorite of mine. My mother would have it on hand for ice cream sundaes, topping for pies and much more. Kenzie has loved this treat for quite some time and now Mason enjoys getting it all over his nose! You can get a coupon for $.55 off COOL WHIP at Walmart (3 - 8 or 16 oz). 1. Add boiling water to combined gelatin mix and 1/3 cup crushed candy in medium bowl; stir 2 minutes until gelatin mix is completely dissolved and candy is melted. I used a water kettle to quickly boil my water. It's actually pretty convenient to have one in the kitchen rather than waiting for the water to boil over the stovetop. 2. Reserve 1/2 cup COOL WHIP. Add remaining COOL WHIP to gelatin mixture; whisk until blended. Spoon into 12 (2-oz) shot glasses. I don't have shot glasses in our home because we don't drink (only on occasion socially) so I used cute mini cube bowls instead and I filled 8. Refrigerate 2 hours or until firm. 3. Top with remaining COOL WHIP and crushed candy just before serving. 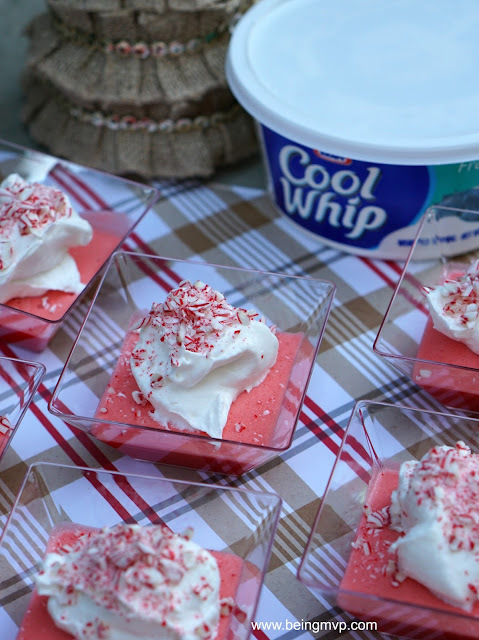 You can spoon the COOL WHIP into a resealable plastic bag and snip one corner to garnish the desserts. However, I just spooned the COOL WHIP right on top using a regular spoon for a more natural dollop look and sprinkled the candy just with my fingers. These are perfect to whip up for play dates, get togethers with friends and even for the New Years' celebration with family in a few days. How will you be sweetening up the season with Kraft? Interesting!! I would've never thought to mix raspberry and peppermint! I do love peppermint with pretty much anything and everything though so I think we will give this a try!! I like simple recipes, too!! Three ingrediants and they look yummy! These look great. I will have to keep this in mind. 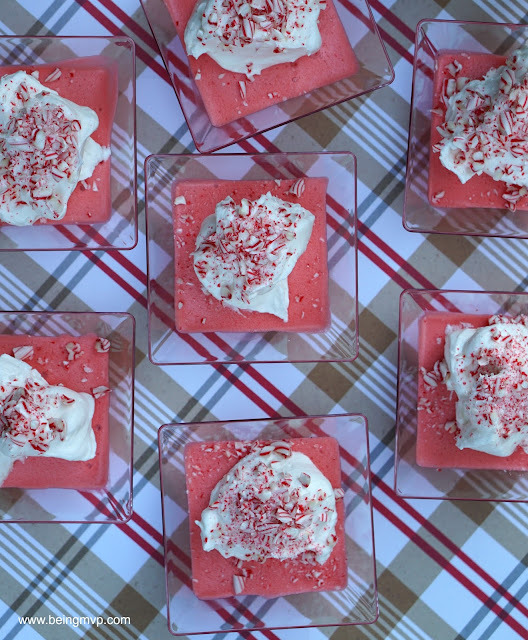 This Candy Cane dessert looks so delicious and fun to make. I think it would also be fun to have for Valentine's day. 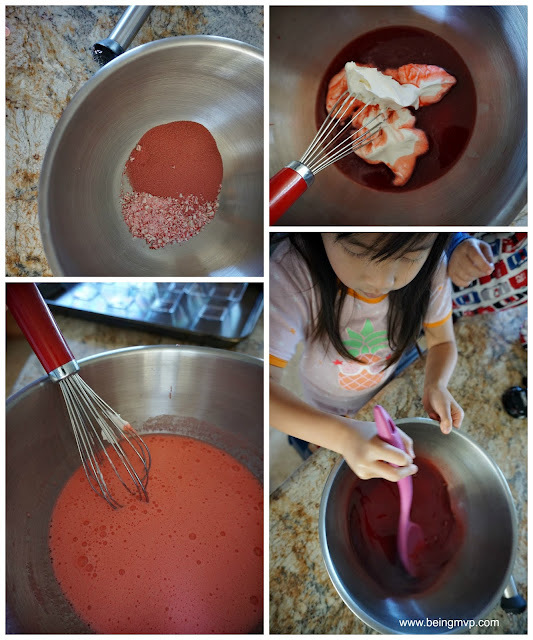 I will have to make this recipe with my niece! Those are so pretty and so easy to make. Thanks for the recipe. It looks very easy but delicious! Thanks for sharing this. These look so festive and yummy too! That looks really easy to make! I love anything with peppermint! What a cute idea! I always make desserts during the holiday season, and I'll have to give these a try, this year. This is an easy holiday dessert and it does look impressive for the little time it takes. I love peppermint too. These sound quick and easy to make and they look really pretty and festive! Thanks for sharing.